Dominic Alistair, Marquis of Vidal and fiery son of the notorious Duke of Avon, has established a rakish reputation that rivals his father's, living a life of excess and indulgence. He is a bad lot a rake and seducer, reckless, heedless, and possessed of a murderous temper. 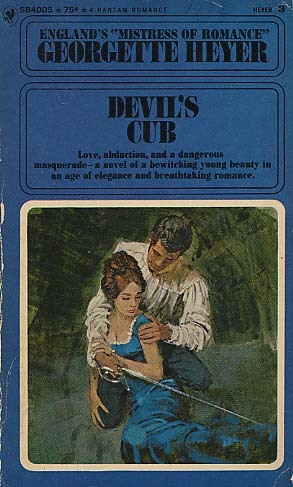 He is known by friend and foe alike as the "Devil's Cub." Yet as the handsome and wealthy heir to a Dukedom, he is considered a good prospect on the marriage market. Vidal currently has his eye on the young, lovely, and unintelligent Sophia Challoner, and Sophia's greedy mother is more than happy to encourage his dubious attentions. Banished to the Continent after wounding his opponent in a duel, Vidal decides to abduct the silly aristocrat bent on seducing him into marriage and make her his mistress instead. In his rush, however, he seems to have taken the wrong woman? Intelligent, practical Mary Challoner knew wicked Vidal, wouldn't marry her sister, despite her mother's matchmaking schemes. So Mary coolly prepared to protect her naive sister by deceiving Vidal. Substituting herself for her young sister, she certainly hadn't expected the nobleman to kidnap and take her to France. She had little notion he would grimly hold her to her part of the bargain. Now he had left her, and she was alone, a stranger in a strange land, prey to the intrigues of glittering, heartless, 18th century Paris. Only one person could rescue her--the Marquis himself. But how could she ever trust this man? How could she even hope to overcome the contempt in which he held her? And how could even the sudden flowering of her love ever bridge the terrible gap between them?